A source inside the government has just told me that Kevin Lynch is out as Clerk of the Privy Council and that Wayne Wouters is the new Clerk. Wouters was recently the Secretary of the Treasury Board. When I confirmed with a friend in the Prime Minister’s Office, he was surprised because they had only found out internally within the last five minutes. UPDATE: It’s officially confirmed. Here’s the release. Ottawa – Prime Minister Stephen Harper announced today the appointment of Wayne Wouters as the new Clerk of the Privy Council, effective July 1, 2009. Mr. Wouters joined the Canadian Public Service in 1982 and is presently Secretary of the Treasury Board. He has served with distinction in a broad range of Ministries including the Privy Council Office. Mr. Wouters was Deputy Minister, Human Resources and Skills Development Canada and Chairperson, Canada Employment Insurance Commission and before that Deputy Minister, Human Resources Development Canada and Deputy Ministry of Labour. Other positions include Director General Department of Energy, Mines and Resources; General Director Department of Finance; and Deputy Minister Department of Fisheries and Oceans. “I am pleased that Mr. Wouters accepted this very challenging role,” said the Prime Minister. “I am confident that his knowledge and experience will provide the dedication and excellence of service that is a hallmark of the Public Service and the Office of the Clerk. What does the future hold for Lynch? Apparently he’s in the running to replace Michael Wilson as our ambassador to the United States. David Emerson is also said to be a contender for the job. Air France flight 358 skidded off of the runway at Pearson International Airport and burst into flames. It is reported that the 243 passengers on board survived with a few injuries. Let’s pray that everyone has escaped serious injury. 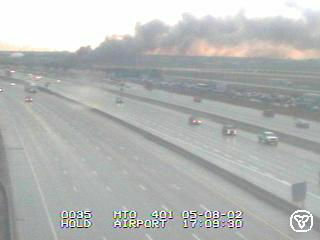 The plane crashed near the 401 and I have a live Google Maps / Toronto traffic cams map. Click on the markers along the 401 for live updates on the scene.